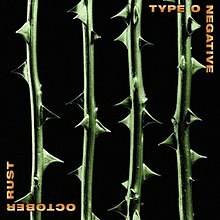 October Rust is the fourth studio album by Type O Negative. It was released in 1996. This is the first album with Johnny Kelly credited as the band's drummer. October Rust has more ballads and less of the doom metal sound of previous or subsequent albums. It also features a much heavier cover of Neil Young's "Cinnamon Girl." It is the first of the band's albums with a "joke intro"; in this case, "Bad Ground", which is 38 seconds of low-level buzzing, meant to sound as if the listener's speakers are incorrectly plugged in. The second and fifteenth tracks are humourous untitled intros and outros to the album, respectively, with the band downplaying the recording of the album. Another production technique employed on the album is the use of very abrupt endings and segues to a few of the songs, heard on the tracks "Green Man", "Red Water", and "Haunted". All tracks written by Peter Steele, except where noted. ^ "Type O Negative - October Rust review". Metal Storm. Retrieved 2 October 2018. ^ Jenkins, Mark (October 25, 1996). "TYPE O: GETTING LESS NEGATIVE". The Washington Post. p. 17. Retrieved October 2, 2015. The new York quartet's sound [on their new album October Rust] now owes as much to the lush goth-rock of the Sister of Mercy as the harsh grind of bands like Carcass. ^ "Austriancharts.at – Type O Negative – October Rust" (in German). Hung Medien. ^ "Ultratop.be – Type O Negative – October Rust" (in Dutch). Hung Medien. ^ "Dutchcharts.nl – Type O Negative – October Rust" (in Dutch). Hung Medien. ^ "Type O Negative: October Rust" (in Finnish). Musiikkituottajat – IFPI Finland. ^ "Norwegiancharts.com – Type O Negative – October Rust". Hung Medien. ^ "Swedishcharts.com – Type O Negative – October Rust". Hung Medien. ^ "Swisscharts.com – Type O Negative – October Rust". Hung Medien. ^ "Type O Negative | Artist | Official Charts". UK Albums Chart. ^ "Type O Negative Chart History (Billboard 200)". Billboard. ^ "American album certifications – Type O Negative – October Rust". Recording Industry Association of America. If necessary, click Advanced, then click Format, then select Album, then click SEARCH. This page was last edited on 3 February 2019, at 00:59 (UTC).